Bing has taken its translator feature into the final frontier. Fantasy and science fiction can be heavy on the fake languages. I blame J.R.R. Tolkien. He had perfectly good real world languages to work with but he had to create his own and inspire generations of nerds to spend hours mastering a skill with little to no practical use. For my part, I've always trouble learning new languages. As a result, I've been the odd man out when it comes to fantasy speech. When all the other nerds are conversing in their fancy Elvish or what-not, I'm left sitting there feeling awkward and wondering if it's me they're picking on my t-shirt. While I might be doomed amongst Lord of the Rings aficionados, I might have a chance among the Trekkies. 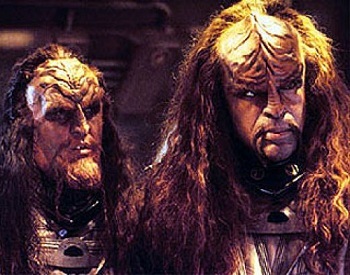 Bing has recently revealed that its translator feature will now be able to turn several human languages into Klingon. While it may seem a fortuitous time for the feature to be added in, what with Star Trek: Into Darkness hitting theaters and all, Bing claims the feature has been in the works for some time now. "Although the new film is coming out soon, this is an idea we were kicking around for awhile," said Matt Wallaert, a behavioral scientist for Bing. "Star Trek has always looked at the future of technology and [Klingon] is the most widely spoken constructed language, even though only a handful of people are actually fluent." To make the translator Bing's contacted and worked with linguistics Ph. D. Marc Okrand who helped to develop the Klingon language for the original Star Trek motion picture series. It also worked with a group of ten fluent Klingon speakers as well as the Klingon Language Institute to help test and adjust the translator. While the translator has trouble with some languages, like Spanish and Italian, it is still a big step for the Klingon and Star Trek. "There have been dictionary efforts with Klingon, there hasn't been a true translation service with full grammatical structure until now," said Wallaert. In addition to benefiting Trek fans Wallaert is confident the experience will come in handy for similar future efforts. "This is a geeky thing for us to do, but it's also a fun challenge of our own teams to enhance translations and work with a language with a distinctive pattern."